I sometimes stumble upon etsy stores that are so amazing that I cannot contain myself and have to share their beauty with you. Impressed by the talent and attention to detail that can be witnessed in all her works, today I am proud to introduce you to Mirjam of Flora Beauty. In her lovely botanical store she offers botanical jewelry with real flowers, designed, created and photographed by her. What makes her shop stand out from a bunch of others is the eco-friendly, non-toxic resin she uses for covering her herbaria - the carefully picked beautiful flowers, pressed for weeks to dry completely and embed in jewelry. Mirjam's love to nature and exquisite attitude to the arts can be felt in every piece in her shop. Starting today and for one week only Mirjam is offering you a chance to win this set of earrings and a ring made with Pumpkin flower petal. Right on time for Halloween! Imagine your outfit complimented by unique orange pumpkin flower jewelry... I personally would love to have them! This giveaway is open worldwide until October 24th. And in the meantime, you can make use of the generous 25% discount that Mirjam is offering for a limited time only. Use code BLOG25 at checkout! I like this rectangle flower ring. My fav is the Hydrangea necklace. I like the Purple Flower Necklace. I *love* the purple carnation real flower earrings. They remind me of my birthstone - amethyst. All this jewlrey is so beautiful! The whole shop is fantastic!! I'll be hinting at my hubby for the Holidays!! I love the lavender necklace! :) (http://www.etsy.com/listing/111588152/real-flower-necklace-lavender-necklace) What an amazing store. Definitely will be doing some xmas shopping here! I love the ladies flower compact mirror. My favorite is the white hibiscus petal ring, although so many lovely items caught my eye! 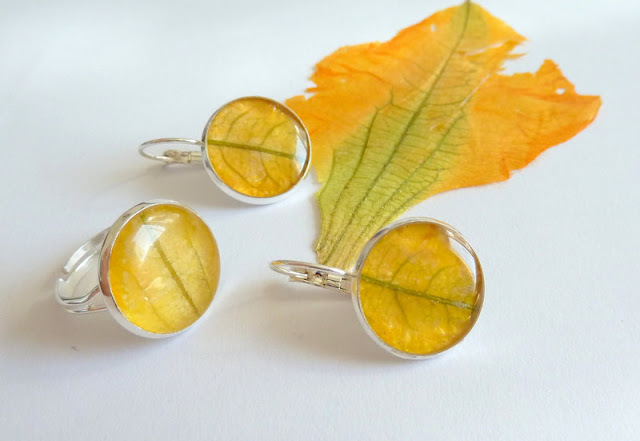 I honestly love these pumpkin petal earrings and ring the most... perhaps it's because I'm in a Halloween/autumn frame of mind! Everything is lovely though. Wow, I love her shop and I just can't decide which article of jewelry do I love the most! Can I say all of them? I really love the pumpkin petal earrings, they have such an special colour and they are really original! These are so beautiful! Love her creativity! My favorites are the real flower earrings with the red leaf design! Eco friendly jewelry. Never found one here...really creative. I love the simplicity of her jewelry...... It's so charming ...... As is nature. Love this shop! And my favorite item is the heart shaped pressed flower earrings. i love the Botanical resin, Real Flower earrings most! they really look great! Pretty! I think I am going to buy the resin, real flower earrings. I love the daisy earrings! Soooo cute!